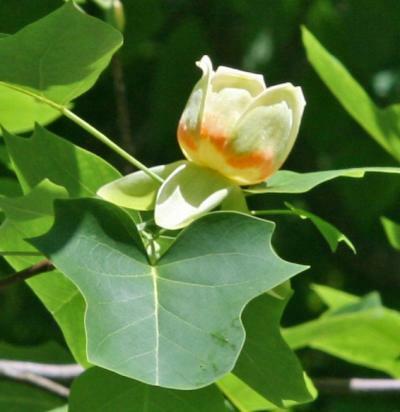 The extraordinary level of conservation of the tulip tree (Liriodendron tulipifera) mitochondrial genome has redefined our interpretation of evolution of the angiosperms (flowering plants), finds research in biomed Central's open access journal BMC Biology. This beautiful 'molecular fossil' has a remarkably slow mutation rate meaning that its mitochondrial genome has remained largely unchanged since the dinosaurs were roaming the Earth. Evolutionary studies make used of mitochondrial (powerhouse) genomes to identify maternal lineages, for example the human mitochondrial Eve. Among plants, the lack of genomic data from lineages which split away from the main evolutionary branch early on has prevented researchers from reconstructing patterns of genome evolution. L. tulipifera is native to North America. It belongs to a more unusual group of dicotyledons (plants with two seed leaves) known as magnoliids, which are thought to have diverged early in the evolution of flowing plants. By sequencing the mitochondrial genome of L. tulipifera, researchers from Indiana University and University of Arkansas discovered that its mitochondrial genome has one of the slowest silent mutation rates (ones which do not affect gene function) of any known genome. Compared to humans the rate is 2000 times slower -- the amount of genomic change in a single human generation would take 50,000 years for the tulip tree. The rate is even slower for magnolia trees, taking 130,000 years for the same amount of mitochondrial genomic change. Ancestral gene clusters and tRNA genes have been preserved and L. tulipifera still contains many genes lost during the subsequent 200 million years of evolution of flowering plants. In fact one tRNA gene is no longer present in any other sequenced angiosperm. Prof Jeffrey Palmer who led this study explained, "By using the tulip tree as a guide we are able to estimate that the ancestral angiosperm mitochondrial genome contained 41 protein genes, 14 tRNA genes, seven tRNA genes sequestered from chloroplasts, and more than 700 sites of protein editing. Based on this, it appears that the genome has been more-or-less frozen in time for millions and millions of years."